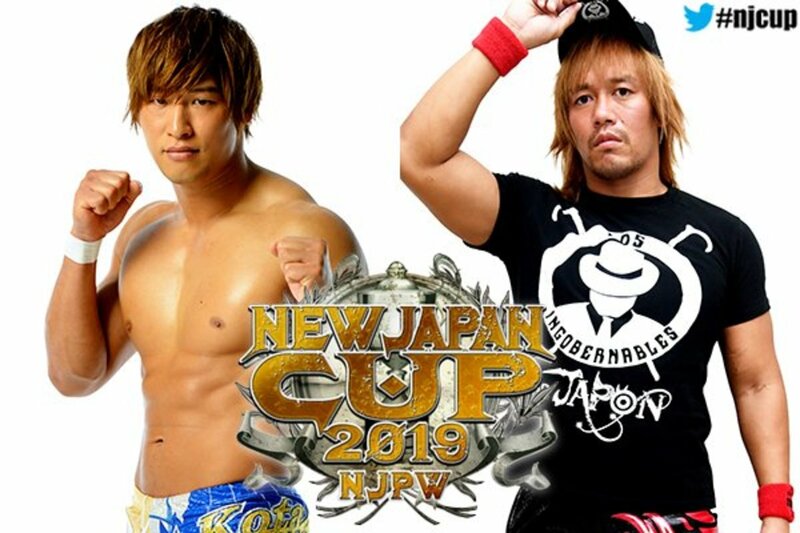 Night 3 of the 2019 New Japan Cup took place today in front of a full house in Hyogo, headlined by Kota Ibushi vs. Tetsuya Naito. The New Japan Cup tournament matches mostly delivered, while the undercard served its purpose, providing previews of upcoming Cup matchups with tag team contests. The top three Cup matches are worth going out of your way to check out. Each was different, and excellent in its own way. Full results and recaps are below. The story of the match was that Tsuji wanted to make a name for himself by going after Suzuki. Suzuki made him pay with chair shots and a series of strikes. Tsuji finally hit a dropkick and tagged Kojima. Kojima and Suzuki went toe to toe. They made tags, but continued brawling outside. TAKA tapped Tsuji out with the Just Facelock. Good little opener. Suzuki and Kojima face off in a tournament match tomorrow. YOSHI-HASHI ran wild at the outset and looked good. Jado hit him with a kendo stick shot, and Bullet Club took over. The best action took place once Juice tagged in. He hit his trademark spots, and dropped HIKULEO with Pulp Friction for the pin. Juice and Nagata danced after the match, which was the real highlight here. SANADA and Goto started off with a nice sequence of holds and reversals. LIJ took control of the match once Honma missed a kokeshi, the template for all Honma matches. Honma connected on his second kokeshi attempt, and Goto and SANADA had another nice sequence. Shingo and Narita tagged in, and Shingo gave Narita a lot of offense. Shingo eventually got the pin after a Pumping Bomber. Lots of stalling early on. Yano wanted no parts of Smith. Taichi wanted nothing to do with Ishii. Suzuki-gun used underhanded tactics, and gained the edge. They worked over Ishii. The crowd really wasn't into it until Ishii hit Archer with a brainbuster. Ospreay got a tag and hit Pip Pip Cheerio, but Archer countered with a Pounce. Smith and Archer hit Yano with a Hart Attack. Taichi removed his trousers. Smith and Archer hit Yano with the Killer Bomb, and Smith got the pin. Smith grabbed a mic after the match and told Yano that he will pay the ultimate price in their tournament match tomorrow. They're trying to establish Nicholls, but there's going to be a tough adjustment period, as the audience doesn't know him. They were quiet here any time he tagged in. His work was good, but this is just going to take time. Okada's chest was severely bruised and welted up, showing the damage from his first round match with Elgin. Okada and Nicholls began, with Nicholls holding his own. Elgin and Henare were in next, with Elgin taking control of the bout with his power moves. Henare reversed a brainbuster from Cabana. Makabe tagged in, but was cut off. He finally made a tag to Okada, who went to work on Nicholls. Okada hit a DDT. Nicholls came back with a spinebuster. Nicholls ducked a Rainmaker, but Okada nailed him with a dropkick. Henare got a tag from Okada, and hit a Samoan Drop on Nicholls. The match broke down, with everyone jumping in. Cabana and Makabe, Okada and Elgin brawled to the floor. Nicholls hit a DVD, a sliding lariat, and used a Mikey Bomb (Blue Thunder Bomb) for the pin. They played an El Phantasmo hype video. Tenzan in a singles match is tough sledding. Taguchi's offense looks good when he has his working boots on, but he had to give Tenzan the bulk of the match since he was doing the honors here. Taguchi asked for a fist bump, but Tenzan declined at first. He finally relented, only for Taguchi to snap his wrists. They traded headlocks. Tenzan did a hip swivel and a crotch chop, then hit a hip attack. Taguchi went for a hip attack, but Tenzan stepped out of the way, then hit a series of headbutts to Taguchi's glutes. Taguchi made a comeback, hitting four hip attacks. Taguchi used a springboard dropkick for a nearfall. Taguchi used an ankle lock, but Tenzan reached the ropes. Taguchi hit two of the three amigos, but Tenzan reversed the third into a vertical suplex. They exchanged strikes. Tenzan raked the eyes and used a Mountain Bomb for a nearfall. Tenzan used an Anaconda Vice, but Taguchi reached the ropes. Tenzan hit a uranage, then went back to the Vice. Taguchi turned it into a rollup for a nearfall. Taguchi hit an enziguri, then hit a Bomaye for a nearfall. Taguchi went back to the ankle lock, but Tenzan kicked his way out of it. Tenzan hit a wheel kick for a two count, then hit a top rope headbutt for another nearfall. Taguchi used a quick cradle for the pinfall. This was everything you wanted it to be, and more. Just a tremendous rookie vs. legend match. Both guys were excellent in their roles. The crowd loved Umino. Watch this match. Umino refused to break cleanly on the first two lockups of the match. Umino used a headlock, Tana reversed it, and Umino used a headscissors to escape. Tana used a chinlock, but Umino again used a headscissors escape. Tana used a standing side headlock. Tana hit a backdrop, a scoop slam, and a leaping elbow, earning a nearfall. Tana used a kneebar, then a modified figure four. Umino forced a break by reaching the bottom rope. Back on their feet, they traded strikes. Tana repeatedly dropped Umino, but Umino fought back to his feet each time. Umino hit a dropkick, then connected with a series of forearms. Umino scored a knockdown with a forearm strike. Umino fought for a bodyslam, and finally got it. Umino fought for a full crab, finally got it, but Tana powered out immediately. Tana hit a dragon screw, then used a crab of his own. Umino made the ropes. Tana hit a slam, followed by a somersault senton off the second rope for a two count. They exchanged strikes. Umino cut off the Slingblade, attacking Tana against the ropes. Umino dropped Tana with a slap, then hit a vertical suplex. Umino went up top, and hit a missile dropkick for a two count. Umino used a full crab, but Tana quickly reached the ropes. Umino used Tana's own hold, the cloverleaf, against him. Tana reached the ropes, forcing a break. Umino hit Tana with dozens of strikes in the center of the ring, dropping him. Umino went for the fisherman suplex, but Tana reversed it into Twist and Shout. He went for the cloverleaf, but Umino turned it into a cradle for a great nearfall. Tana hit an inverted dragon screw, then applied the cloverleaf, and Umino tapped out. They had a tough time getting the crowd, but they finally got them into it. These guys work really well together. They played off a lot of their previous matches, using a number of clever counters, reversals, and misdirection spots. A very good match. Sabre wanted to lock up, but EVIL kicked him in the gut, and immediately went to a side headlock. Sabre arm dragged out of it, but EVIL used a headscissors. Sabre escaped, bounced to his feet, but ran into a shoulder block. They locked knuckles. EVIL used his power to maintain the advantage. EVIL slipped out and went for a senton, but Sabre rolled out of the way, then locked on an armbar. EVIL kept his hands together, then reached the ropes. Sabre used a surfbaord, then wrenched on EVIL's fingers, slipped to a hammerlock, then to a lateral press, picking up a two count. For the second time, EVIL avoided a PK, then hit a mid kick. EVIL hit a sidewalk slam, and a vertical suplex. He picked up a nearfall. EVIL went for Darkness Falls, but Sabre slipped to a full nelson. EVIL escaped and hit a big knee strike. They did a cool corner strike, opposite corner strike, misdirection, lariat spot. EVIL hit the lariat, then used Darkness Falls for a two count. They traded rollups. EVIL used a backslide for a nearfall, but Sabre popped out of it and finally connected with a PK. Sabre stomped on EVIL's left arm. EVIL hit a chop with the right arm. They did another misdirection spot, but Sabre came out on top this time, and tied EVIL up with a wacky submission. It was a body scissors, but he also trapped the left arm. Sabre went after the right arm, torquing it with his legs, then hit another PK. EVIL used the referee as a human shield, then lifted Sabre onto the ref's shoulders. EVIL hit a ref-assisted Magic Killer. That was innovative. EVIL connected on a superplex, and picked up a two count. They did a crazy series of counters, ending with EVIL connecting with a spinning lariat. Sabre escaped Everything is EVIL a number of times, and was able to apply Napalm Death. EVIL tapped. Great match. The last third especially was insane. They locked up, then went into a crazy series of holds, counters, and flips, ending with both men posing. Naito rolled to the floor, stalling. Ibushi chased him, but Naito caught him coming back inside. Ibushi went to the apron. Naito hit a sweep, then connected with the combinacion de cabron on the apron. Naito sent Ibushi into the barricade three times. Ibushi sold his neck. Naito took Ibushi into the press area, and sent him into a table. Ibushi beat the count back inside. Naito hit a back elbow, then a dropkick to the neck. Naito used a neckbreaker. Ibushi hit a couple of forearms to the chest, but Naito followed up, hitting three elbows to the neck. Ibushi sent Naito into the ropes, then hit a dropkick, his most notable offense to this point. Ibushi hit a series of mid kicks, then used a standing moonsault for a two count. Ibushi connected with a snap rana, sending Naito to the outside. Ibushi went for the Golden Triangle, but Naito cut him off, then hit a neckbreaker on the apron, sending Ibushi to the floor. Naito hit a one-legged dropkick, then a hangman's neckbreaker for a nearfall. Ibushi landed on his feet out of a suplex attempt. Naito hit an enziguri, but Ibushi countered with a suplex. They traded strikes from their knees. Back on their feet, they continued trading. Naito hit a spinebuster. Naito teased a reverse rana off the top. Ibushi fought him off. Naito rolled to the apron. Ibushi teased a german, but Naito pulled Ibushi to the outside, and hit a tombstone on the apron. Back inside, Naito hit Gloria for a nearfall. Naito went for Destino, but Ibushi turned it into a package piledriver. Ibushi got a two count. Ibushi hit a spinning roundhouse. He went for a last ride, but Naito turned it into a swinging DDT. Naito went for Destino, but Ibushi hit a lariat. Ibushi hit a last ride, but Naito kicked out at two. Ibushi missed with a Kamigoye. Naito hit Destino, but Ibushi kicked out. Naito went for another Destino, but Ibushi slipped out and hit a high kick. Ibushi hit a Bomaye for a great nearfall. Ibushi hit a Jay Driller, spiking Naito right on his head, then hit the Kamigoye for the pin.